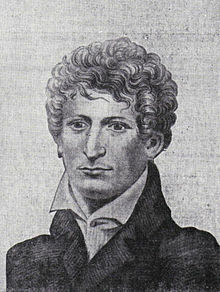 On this date in 1803, Michael Ely hanged at Newgate Prison for feigning a bit of glory in the ongoing Napoleonic Wars. The crime was no stolen valor stuff, but “personation” — fraudulently presenting oneself as a different person, in this case with a plain pecuniary objective. Ely presented himself to the crown’s prize agent as the Audacious seaman Murty Ryan to collect Ryan’s jackpot of one pound, 12 shillings. 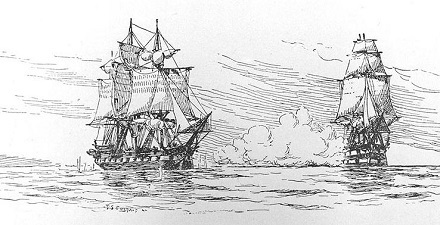 One problem: Francis Sawyer was actually acquainted with the crook personally and (so he testified later) “I told him I knew his name was not Murty Ryan.” Ely countered by alleging that he had changed his name to avoid punishment after deserting a previous impressment — a phenomenon that Sawyer agreed was “quite common” and a good enough excuse that Sawyer paid him out, albeit suspiciously. But once the real Murty Ryan showed up looking for his share, Audacious crew members were able to verify that whatever his name might be, that first guy had never been aboard their ship. Gentlemen, you must not mistake me. 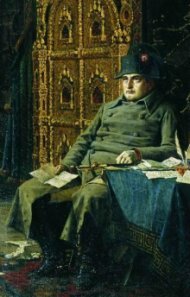 I admit that the French Emperor is a tyrant. I admit that he is a monster. I admit that he is the sworn foe of our nation, and, if you will, of the whole human race. But, gentlemen, we must be just to our great enemy. We must not forget that he once shot a bookseller. 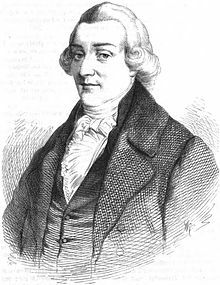 Nuremberg bookseller Johann Philipp Palm was shot on this date in 1806 for publishing a manifesto against the French occupation. For centuries a proud Free Imperial City, Nuremberg had over the few months preceding Palm’s martyrdom been smushed up by the conquering Grande Armee into an amalgamated French client, the Confederation of the Rhine. This was a huge political shakeup. Even the Empire of which Nuremberg had been a Free Imperial City was no more: the 854-year-old Holy Roman Empire was dissolved in 1806, a casualty of the Battle of Austerlitz. At just 25,000 residents and far removed from its mercantile preeminence of yesteryear,* Nuremberg wasn’t even one of the Confederation of the Rhine’s 16 constituent polities: it had been rolled up into Bavaria, in a partial cleanup of the tiny Kleinstaaten pocking the old German map. Nuremberg’s prostration in this arrangement mirrored Germany’s as a whole vis-a-vis the Corsican. 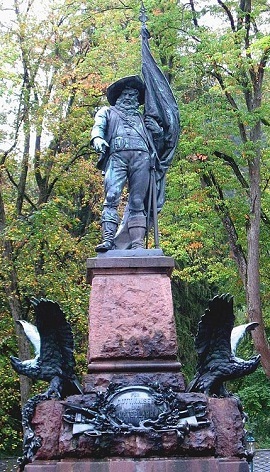 Napoleon was the official “protector” of the Confederation of the Rhine, and its end of the protection racket entailed shipping conscripts to the French army. The Confederation of the Rhine ultimately included four kingdoms, five grand duchies, 13 duchies, 17 principalities, and the Free Hansa towns of Hamburg, Lübeck, and Bremen, and covered much of the territory of present-day Germany (sans Prussia). For some odd reason, Germans whose dreams of national unification were beginning to stir weren’t too enthusiastic about having it marshaled by France. 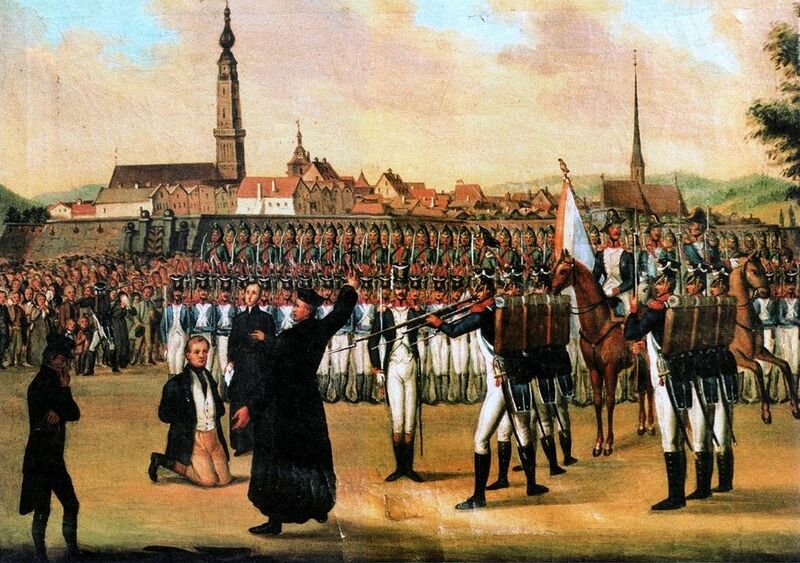 In July of 1806, Palm gave voice to the sentiment by publishing a 144-page treatise, Germany in its Deep Humiliation. (It’s available online in an 1877 printing at archive.org.) The identity of the seditious author(s) he resolutely kept secret, but it’s commonly attributed now to Count Friedrich Julius Heinrich von Soden. Palm had the fortune or sense to be safely away in Prussia by the time irate Frenchmen raided his shop, but was caught after he boldly slipped back into the city against all sensible advice. He was transferred to a fortress at Braunau am Inn, and shot there. Braunau am Inn, now a charming little burg of 16,000 just over the border into Austria, is probably best recognized in the wider world these days as the birthplace of Adolf Hitler … and it turns out the little future Nazi was deeply stirred by Palm’s model of patriotic sacrifice, albeit less so his model of an independent press. We find out all about Hitler’s admiration of Palm in the very first stanzas of Mein Kampf. Today it seems to me providential that Fate should have chosen Braunau on the Inn as my birthplace. For this little town lies on the boundary between two German states which we of the younger generation at least have made it our life work to reunite by every means at our disposal. German-Austria must return to the great German mother country, and not because of any economic considerations. No, and again no: even if such a union were unimportant from an economic point of view; yes, even if it were harmful, it must nevertheless take place. One blood demands one Reich. Never will the German nation possess the moral right to engage in colonial politics until, at least, it embraces its own sons within a single state. Only when the Reich borders include the very last German, but can no longer guarantee his daily bread, will the moral right to acquire foreign soil arise from the distress of our own people. Their sword will become our plow, and from the tears of war the daily bread of future generations will grow. And so this little city on the border seems to me the symbol of a great mission. And in another respect as well, it looms as an admonition to the present day. More than a hundred years ago, this insignificant place had the distinction of being immortalized in the annals at least of German history, for it was the scene of a tragic catastrophe which gripped the entire German nation. At the time of our fatherland’s deepest humiliation, Johannes Palm of Nuremberg, burgher, bookseller, uncompromising nationalist and French hater, died there for the Germany which he loved so passionately even in her misfortune. He had stubbornly refused to denounce his accomplices who were in fact his superiors. In thus he resembled Leo Schlageter. And like him, he was denounced to the French by a representative of his government An Augsburg police chief won this unenviable fame, thus furnishing an example for our modern German officials in Herr Severing‘s Reich. In this little town on the Inn, gilded by the rays of German martyrdom, Bavarian by blood, technically Austrian, lived my parents in the late eighties of the past century; my father a dutiful civil servants my mother giving all her being to the household, and devoted above all to us children in eternal, loving care Little remains in my memory of this period, for after a few years my father had to leave the little border city he had learned to love, moving down the Inn to take a new position in Passau, that is, in Germany proper. * Back when being the executioner of Nuremberg was a plum assignment. 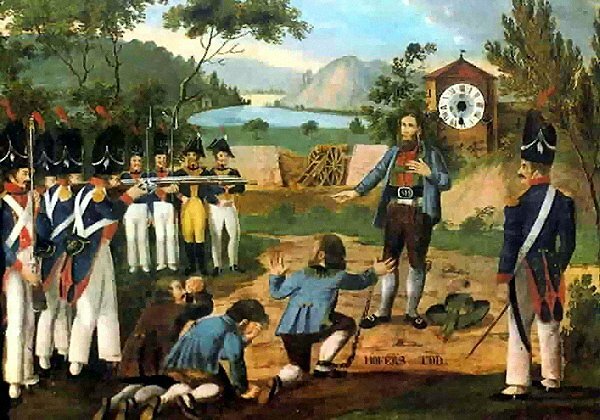 On this date in 1806, the Neapolitan partisan Michele Pezza was hanged as a bandit. 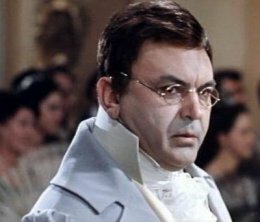 Better known by his infernal nickname “Fra Diavolo” — “Brother Devil” — Pezza (English Wikipedia entry | Italian) was forced into the army of the Kingdom of Naples as punishment for manslaughter in 1797, just in time to experience its thrashing at the hands of the French Republicans rolling down the peninsula. By 1799, Naples was no longer a kingdom at all, but a French-modeled and -backed republic, one of several in Italy. Populist, Catholic resistance to these impositions commenced almost immediately. Fra Diavolo was destined to become the enduring legend of this sanfedismo movement. Pezza’s band, which eventually numbered as much as 4,000, stalked the roads around Rome and Naples, terrorizing French soldiers and Republicans. They had a reputation for cruelty. Actually, his effectiveness with irregulars was a very significant redeeming point in a dirty-war environment. After Naples’ Parthenopean Republic was deposed by France’s foes, Pezza was retired with an aristocratic title, a substantial pension, and a trophy bride: just the Bourbons’ way to say thanks. 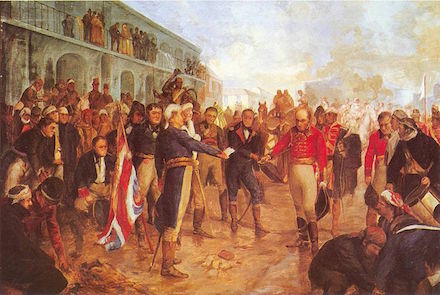 But he was recalled to the field when the French re-invaded Naples in 1806, briefly installing Napoleon’s brother Joseph Bonaparte as the new Neapolitan king, and again set to raiding with a mass of guerrillas. 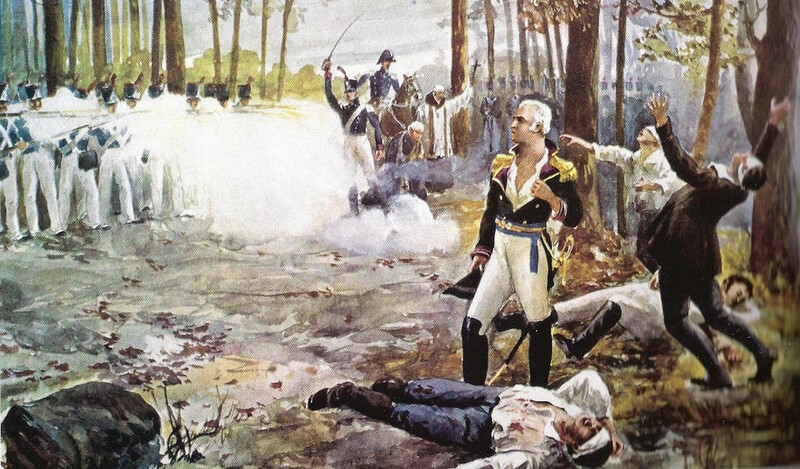 This time the French hunted him to ground, defeating his irregulars in an October 1806 engagement and capturing Fra Diavolo himself days later. Pezza hanged as a brigand in Naples, but the city’s exiled royalty funded a funeral mass for their lost commander in the cathedral of Palermo. Maceroni wasn’t kidding about the “fine music and operative representation,” by the way. 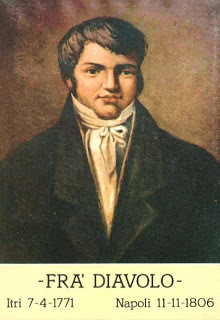 Daniel Auber composed a hit 1830 debut, Fra Diavolo. Two centuries ago today, Johann Christian Claudius Devaranne got himself shot for resisting Napoleon’s draft in Germany. The Corsican had fallen back following the debacle of occupying Moscow, but the attempts of Napoleon-allied forces to recoup dwindling numbers by conscription provoked fierce resistance in Solingen — where the draft board was driven out and recruiting materials destroyed. 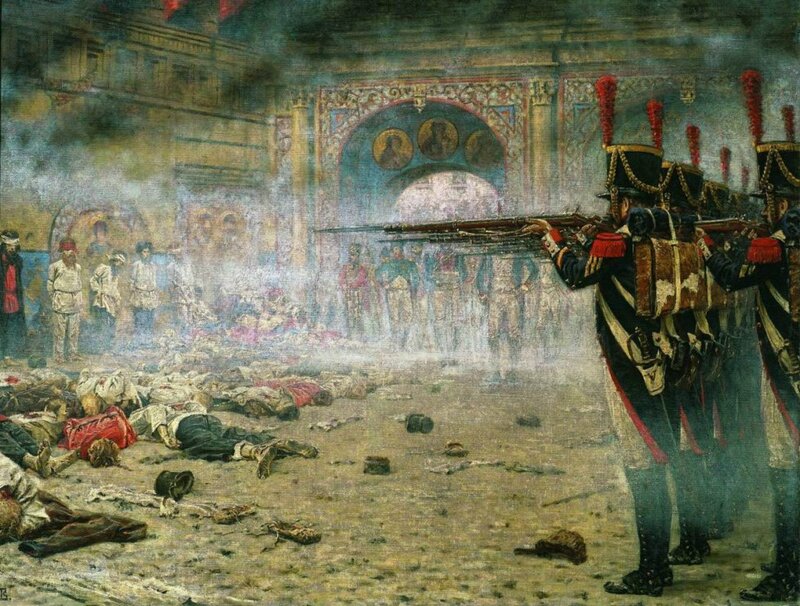 This little flare-up goes by the excellent title of the “Russian Truncheon Insurgency,” but it soon ran into the bayonets of Napoleon’s German partners. On January 30, 1813, a week after draft riots first erupted, troops began suppressing it. Devaranne, a 29-year-old father of five, was seen as a leader in the resistance and a price put out on his head … a price his own maid collected when the fugitive innkeeper was reckless enough to sleep at home one night. 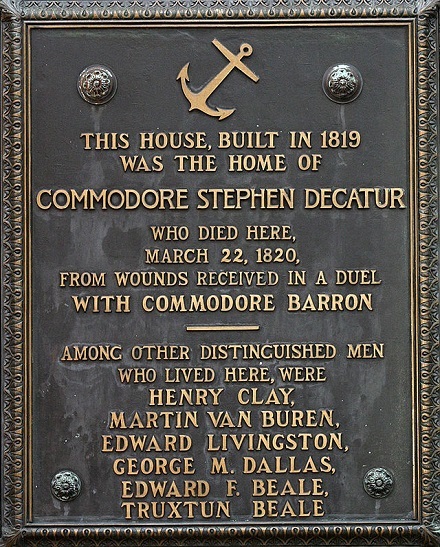 He was tried and shot at Dusseldorf months later, during a lull in the year’s bloody campaign season. For the 120th anniversary of Devaranne’s execution — which was also six months into Adolf Hitler’s Chancellorship — Solingen dedicated a memorial plaque to Devaranne, claiming his nationalist martyrdom as its own. The plaque went missing after the war, but Devaranne still has a street named after him in Solingen. 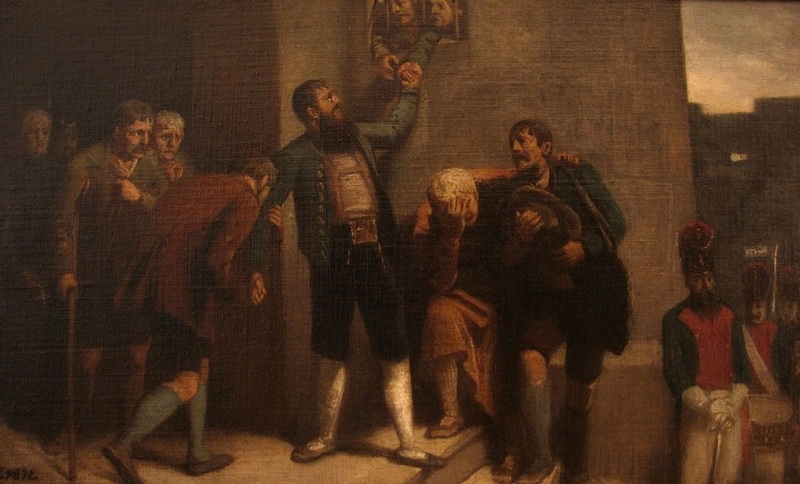 Two centuries ago today,* the author of one of the weirdest attempted coups in history was shot with his co-conspirators. Picture Valkyrie in Napoleonic Europe. Claude-Francois de Malet (English Wikipedia entry | French) had spent the years of his confinement for republican sensibilities painstakingly readying bogus orders and decrees for the eventual rollout of the most audacious putsch you’d ever want to putsch. While Bonaparte was off on campaign trashing Russia, Malet broke out of his sanitarium and went to work. But the attempted coup which aimed so high ultimately made for little but tantalizing counterfactual history. Officers with clearer heads soon realized that they had received communiques from the Emperor dated after his purported October 7 death; one of those officers arrested Malet. A tribunal was constituted later that same date. It had little difficulty condemning 14 (French link) during the small hours of the morning on Oct. 29. They were shot later that same day (at least, most of them were; there are oddly conflicting accounts on this point). 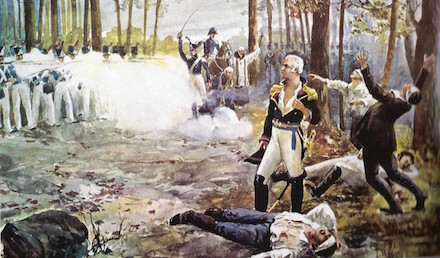 This public-domain French text preserves a first-person narration of the scene, in which Malet himself — usurping authority to the very last — commands the firing platoon that’s lined up to shoot his comrades. While the Malet plot failed on its own terms, it got quite a lot farther than it had any right to expect — and this fact rightly alarmed the Corsican. 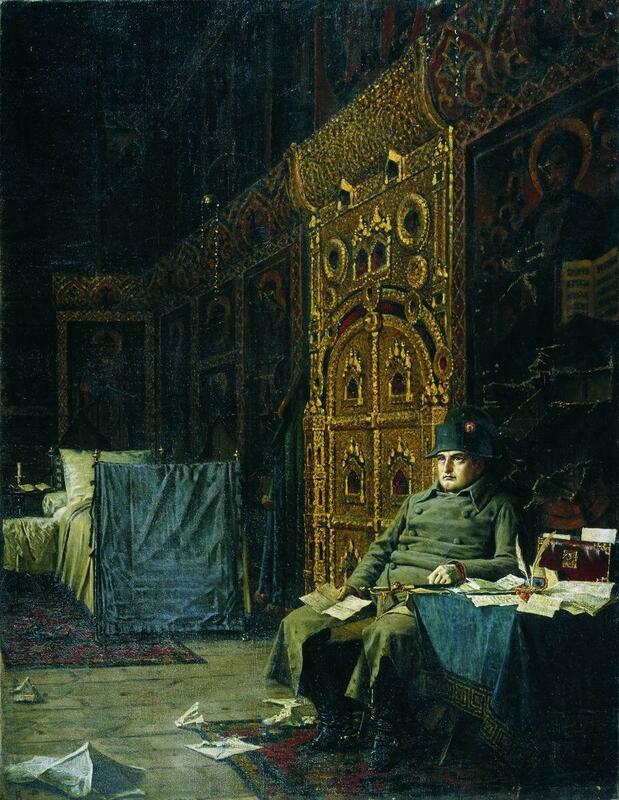 “Bad News From France”, by Vasily Vereshchagin, depicts a retreating Napoleon — bunking in an Orthodox church — finding out about Malet. Was his position that precarious? And why, if some officers genuinely believed him dead, did nobody hail as emperor his infant son and designated heir? Napoleon had already begun his catastrophic retreat from Russia when he got word of Malet’s attempted coup d’etat; the struggling Grande Armee was dwindling daily under the battering of cold, desertion, and Russian snipers. Now this? 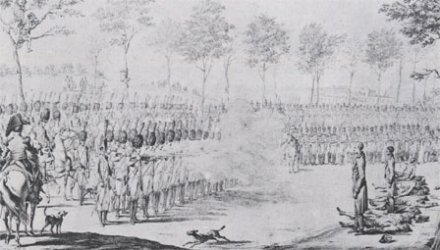 Upon discovering his late narrow escape from a homefront conspiracy, Napoleon left his miserable troops under the command of Murat* and raced ahead of them back to Paris to secure his own position. This new confluence of domestic vulnerability and foreign defeat marks the beginning of the end for Napoleon. Europe ganged up on the weakened French, and less than 18 months after Malet faced his executioners, France’s own generals forced Napoleon to abdicate. * Murat soon ditched the army himself to try to preserve himself as King of Naples. (That didn’t end well.) 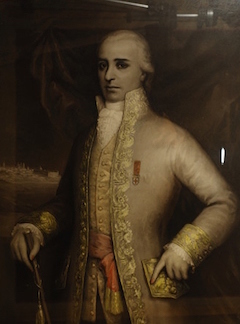 The once-gigantic army’s remnants finally straggled home under the third-string leadership of Eugene de Beauharnais — the capable son of Josephine’s guillotined first husband.